The Rhône Valley is in southern France and divides itself into two distinct areas: Northern and Southern Rhône. Climates and soils vary greatly between the two but there are two things that connect them: the Rhône River and the Mistral wind. The Mistral is an intense wind that blows year-round and can reach speeds 60+ mph. It delivers sunny skies, dry weather and clear air but also come with crop risks because of its strength. The wines of the Northern Rhône are mostly dry reds made from Syrah. These wines are meant to age. The whites of the area are Viognier, Marsanne and Roussanne. Most of the grape harvesting is done by hand because the steep slopes and terraces are not accessible to machines. 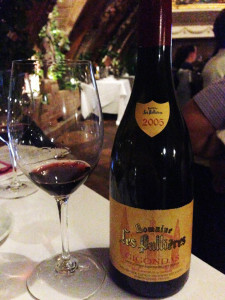 Because of their high tannin content, Northern Rhône wines tend to benefit from decanting. In the Southern Rhône, few things grow well in the rocky soils. Vines are the exception, with 27 grape varieties thriving in this area. Wines from this area are considered “classic” and exhibit significant consistency from year to year. 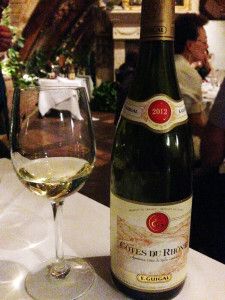 There are currently 171 (out of 300) wine-producing villages in the Rhône Valley that produce Les Côtes du Rhône (CDR) wines. The Southern Rhône produces 95% of all CDR wine. Of the total, 92% is red, 4% is rose and 4% is white. 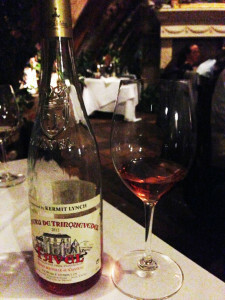 For red and rosé CDR wines, 40% of the blend must be Grenache. 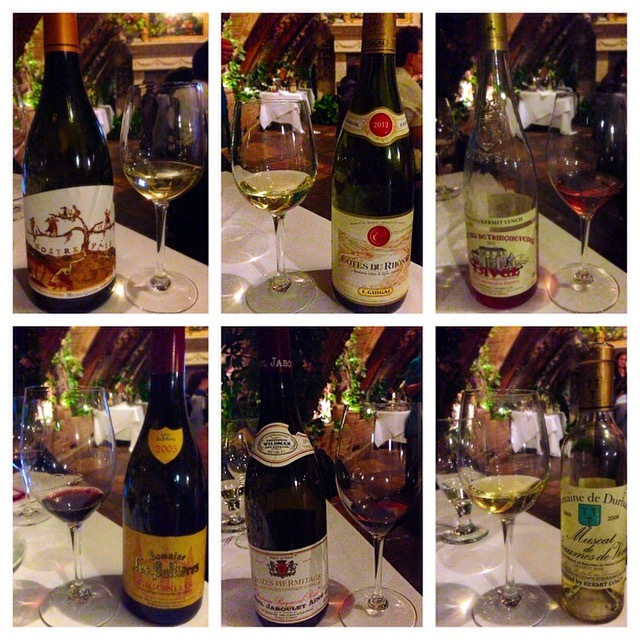 35 million cases of Rhône wines are sold each year. A total of 31 grape varieties are planted throughout the entire Rhône Valley. Two grapes grown in the region, Syrah and Viognier, have both been genetically proven to be indigenous to the Rhône Valley. In 1936, Châteauneuf-du-Pape received AOC status. The AOC system was created by a local Baron who wanted to guarantee authenticity of the product. This system is still in operation today. Lyon is the culinary heart of France. There are more Michelin-starred restaurants here than in any other French city outside of Paris. 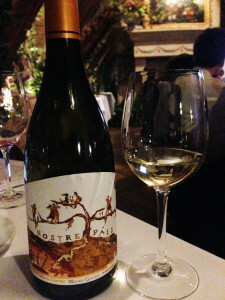 Michel Gassier Nostre Païs Costières de Nîmes 2012: This winery is the Rhône Valley’s most southern. The fourth generation winemaker believes that a great wine should be “a voyage of the senses” and allows the wine to express the terroir—resulting in floral and mineral notes with accents of fresh citrus fruits. Goat cheese, rabbit, halibut and shrimp are ideal food pairings. This wine is available in Utah for $21.99. E. Guigal Côtes-du-Rhône Blanc 2012: The vines and wines of this vineyard have been famous for 2,400 years! This blend of 70% Viognier, 10% Roussanne, 9% Marsanne, 8% Clarette and 3% Bourboulenc leads to aromas of flowers, apricot and white peach. It pairs well with fish and Asian foods. It can be purchased at Utah DABC stores for $17.03. Château De Trinquevedel Tavel Rosé 2012: This vineyard is farmed in the lutte raisonée style with an average vine age of 32 years. Red fruits and garrigue spiciness are characteristics of this 45% Grenache, 24% Cinsault, 15% Clairette, 10% Mourvèdre and 6% Syrah blend. A great summer wine, you can purchase it for $20.99. 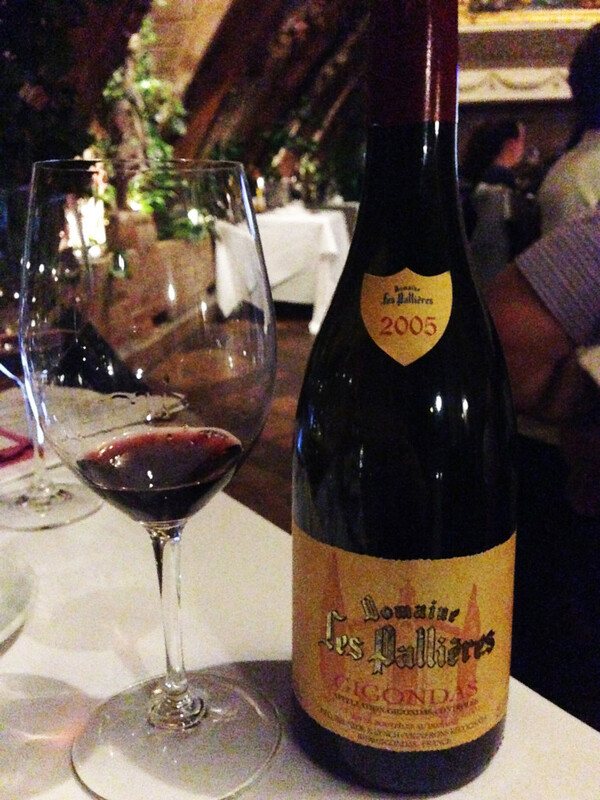 Domaine Les Pallières Gigondas 2005: The property is farmed lutte raisonée where the grapes are hand-harvested. When young, this wine is rich with cherries, strawberries and ripe blackberries. With age, it develops truffle and woodland scents. Veal ribs with mushrooms and game birds are the perfect pairing for this Grenache blend. This wine is available in Utah for $53.45. 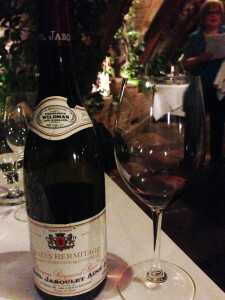 Serge & Nicolas Domaine Cabirau Maury Sec 2013: The 1961 vintage of L’Hermitage La Chapelle (the Domaine’s flagship wine) is listed among the “12 mythical bottles of the 20th century” and can be purchased in Utah for $299.75! This 2004 wine is 100% Syrah from 40-60 year old vines. It needs 8-10 years of cellaring to fully appreciate the complex notes of red berries and sweet spices. Veal sweetbreads, roast beef and red partridge would be excellent pairings. 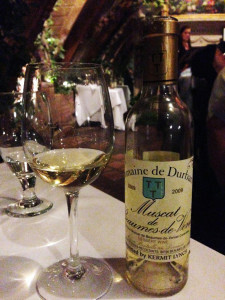 Domaine de Durban Muscat de Beaumes-de-Venise 2009: Pine trees protect this vineyard from the Mistral which is farmed lutte raisonée. The 100% Muscat a Petits rains Blanc come from vines averaging 35 years in age. Pear, apricot, rose petals and tropical fruit are redolent in this 15% alcohol Muscat. Perfect pairings include strawberry shortcake, crème caramel or flan. You can find this wine through DABC for $17.99 for 375 ml.